Since invention, universal garage door openers have witnessed a great improvement in design, motor performance, and lifting methods. 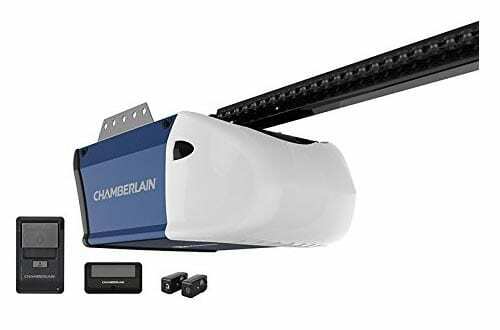 Home improvement stores are stuffed with tons of garage door openers with remote that will leave you confused. Well, one thing to note is that garage door opening mechanisms aren’t the same. There are just too many options to choose from ranging from chain, screw, to belt drive systems. Each type has its own benefits and advantages. To make it easy, you need to keep in mind the basic fitting considerations that will match your need. From the whole avenue of options available, there are some models out there that outperform the rest in terms of budget-friendliness, performance, and ease-of-use. 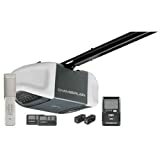 Below is a roundup of the best overhead garage door openers you need to consider. 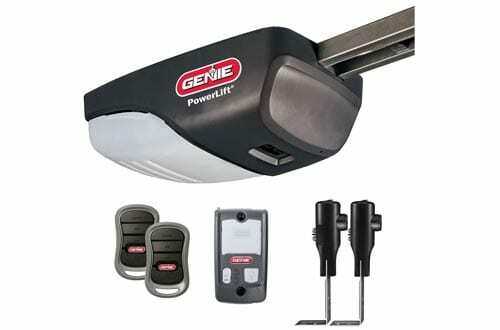 This is a strong, ultra-quiet garage opener powered by a 1/2 hp belt drive system. The motor vibration isolation system is what keeps the noise level at a minimum. The opener comes with an auto-close timer that can be set to 1, 5, or 10 minutes. Reinforced steel construction used on the belt drive system gives exceptional power and durability. The opener can link to your smartphone so you know if your garage door is opened while you are away. It’s compatible with fluorescent bulbs for added safety. 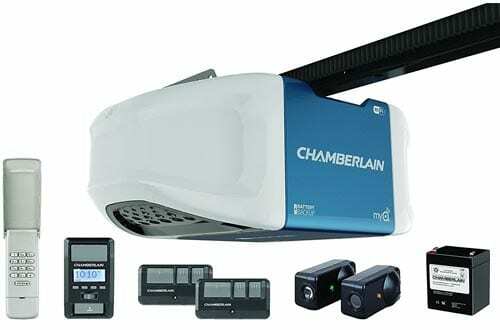 Chamberlain WD962KEV takes ultra-quiet performance a notch higher. 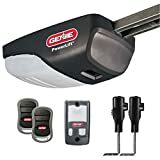 This garage opener is equipped with a 3/4 hp DC belt drive system that delivers exceptional power. A built-in battery with a backup system ensures normal use in case the power is out. The timer closes the door automatically in case you forget to do so. The timer can be set to 1, 5, or 10 minutes. A wireless system lets you control your garage door using your smartphone. This door opener is a perfect blend of power and whisper-quiet performance. It’s equipped with a steel-reinforced belt drive system rated at 1/2 hp. Monitoring and controlling the garage door while away can simply be done using your smartphone device. An automatic closing system is made a reality with a timer that can be set to a maximum of 10 minutes. There’s a protector system that automatically reverses the door in case of any interruption. 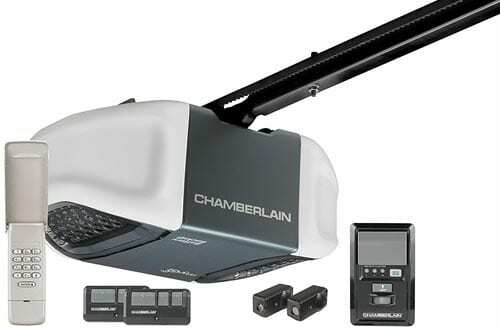 This is a rugged and reliable garage door opener equipped with 1/2 hp industrial-grade belt drive system. Two pre-programmed remote controls ensure you get consistent performance over a long range. The opener is equipped with a rolling code technology that keeps the door closed. A wireless control system lets you control everything from the security system, appliances, to lighting from the comfort of your car. The rail system sets up in just 60 seconds. Chamberlain PD762EV runs on 3/4 hp motor. It’s equipped with a rugged chain system to ensure steady and reliable performance. Thanks to an advanced technology, you can let your smartphone double as the garage opener while you are away. You’ll get notifications of any intrusions from anywhere you are. The opener is compatible with a remote system that can be built into your car for great convenience. A tri-band technology keeps interference at a minimum to ensure you get better range and performance. 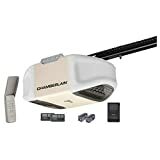 This garage door opener is specially designed for garage doors with a maximum height of 7 feet with 4-inch ceiling clearance. It gives the convenience of smartphone monitoring while you are away. This opener is equipped with 1/2 hp reinforced-steel belt drive system that gives constant, steady performance. There’s a built-in vehicle control system you can use to operate everything from the comfort of your car. A powerful light comes on in case an interruption is detected. 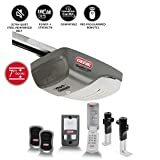 This is a garage opener with a built-in Wi-Fi system. 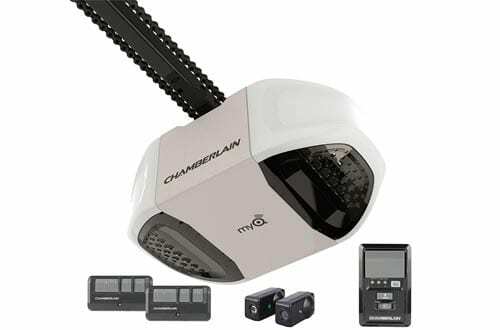 It enables the monitoring and controlling of the garage door from anywhere you are. There’s a battery backup system to ensure smooth running even when the power is out. The battery lasts up to 72 hours on a single charge. The opener has a heavy-duty belt drive system designed for steady, whisper-quiet performance. It comes with an LCD screen that displays temperature, time, and diagnostics. 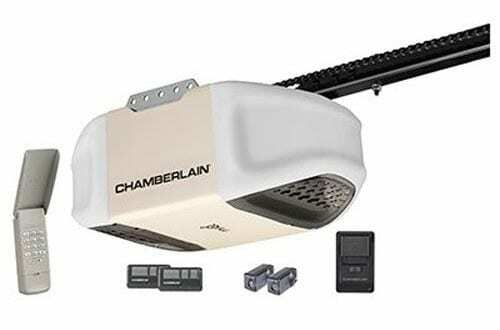 Chamberlain PD510 is designed to be compatible with 100 watts of lighting. It comes with a 1-button tri-band remote designed for consistent, long-range performance. The anti-theft rolling code technology keeps the door locked to ensure maximum security. The 1/2 hp chain drive system gives a reliable industrial-grade performance. Home link buttons let you control the garage opener from the comfort of your vehicle. This opener has the power you need to operate heavy garage doors. It can handle garage doors up to 500 pounds. The opener comes with two pre-programmed remote controls for great convenience. The door reverses via an invisible light beam to keep out intruders. This garage opener is equipped with a low-profile C-channel rail system that’s virtually maintenance free. That means no chains, belts, or gears to wear out. The opener is compatible with home link buttons. It’s compatible with two 60-watt bulbs. 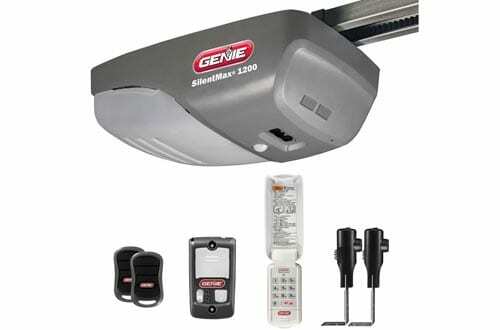 Genie SilentMax 1200 is driven by a powerful DC motor that has a soft start and stops function for smooth door travel. A C-channel rail system with a low-profile design fits flush for a clean and easy-to-maintain look. 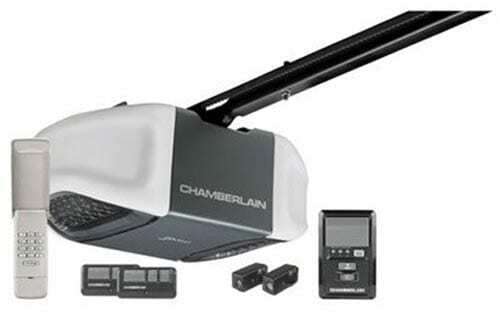 As the name implies, this garage door opener gives ultra-quiet and smooth operation. The door opens at a speed of 9 inches per seconds for added security. A self-diagnostic T-beam system comes in handy to prevent unauthorized entry. This opener is compatible with two bulbs rated at 100-watts each.